This mysterious form of wordplay known as the palindrome—in which a group of phrases can be read both forwards and backwards—has bewitched and beguiled readers for centuries and, due to its mirrored, dualistic quality, was at one point considered to have magical powers. Now, in the hands of palindrome master William Irvine, combined with these witty and exquisitely drawn illustrations by Steven Guarnaccia, the result is a delightful mix of literary and absurdist humor. 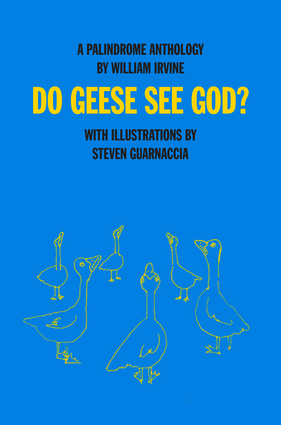 In the spirit of Edward Gorey, Do Geese See God? will appeal to all lovers of wordplay, codes, puzzles, anagrams, crossword puzzles, and linguistic brainteasers. Steven Guarnaccia is an illustrator and designer, and Associate Professor at Parsons The New School for Design, where he was the director of the Illustration Program from 2004-2011. More recently, he was the Art Director of the Op-Ed page of the New York Times. William Irvine is an editor, writer, and avid logophile.